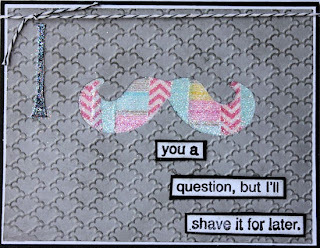 The Way to Use it Challenge on SCS in to add a Mustache to your card. I made this using the Technique Junkies Glittery Washi Windows. The Sentiment is Riley & Co., and the die is Hero Arts. I added Washi- how fun is this! Love the card Shelly, and I think the 'sentiment' is so punny it is excruciating! Love it. Great use of tape and love the glitter. Thanks for joining us at Totally Papercrafts. Fun is right! 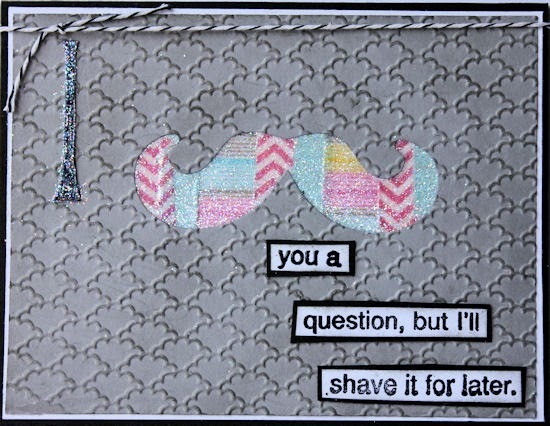 Love that washi mustache and cute sentiment! Beautiful card, great image, thanks for joining in at Alphabet Challenge. Very cool idea for Movember. (that's what we call it in Canada, is it the same for the States?). I love how you used this technique for the mustache. This card makes me smile. The mustache window is adorable and the sentiment is a hoot. Thanks for joining our Anything Goes/Use twine challenge this fortnight at Craftitude. I hope we see you again soon. Masculine and humorous. What more can you ask for! Wonderful card and love th colorful washi tape! Oh this is so cute and fun Shelly, I love that sentiment! Thanks for joining us at Alphabet Challenge Blog! That's really an awesome card. Love the sentiment you have used with it. LOL, what a great card! How cool the washi window is, I haven't seen that technique before. Thanks for joining us over at Left of Center Challenges this week.